The dictionary defines “volunteer” as “a person who performs a service willingly and without pay.”Â Yet, there is a great value in finding small rewards that can help bring in and retain disaster volunteers. I know that from my own experience with CERT, but I also heard a similar message atÂ a Business Roundtable-Partnership For Disaster Response panel I moderated at the American Red Cross’s headquarters in Washington. I am holding the ‘graduation certificate’ which I quickly framed. 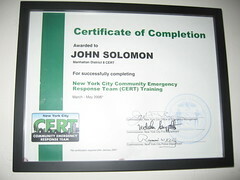 OEM gave me another certificate for completing a training at the City’s Emergency Operations Center in downtown Brooklyn, which also quickly went into a frame and on my office wall. I know I’m not the only one who puts these photos and certificates up on their walls (or on their Facebook pages). That’s important in engendering a team feeling and pride among the volunteers. It’s particularly vital for a program like CERT since it is made up of citizens from all over the community who only meet once a month. Integrating these types of incentives into disaster volunteer programs is easy and inexpensive, but offers a great return. 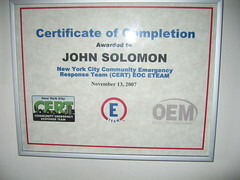 John, this seems to be a great organization and congratulations on your certification. I happen to be a neighbor of yours and hope to see you very soon.